How can we build political will to take responsibility for climate? It is time to invest in grounded hope. We should inoculate the world with an attractive, rigorous, comprehensive path toward climate success, as a means of helping people see and own the climate challenge in the first place. I think we need to see the solution in order to see the problem. We’ve seen the alternative work first hand. Over the past year, I’ve facilitated large groups of Stanford graduate students, international energy execs, a climate-and-business advisory panel in Washington, D.C. and others, and asked them to chart out viable solution paths and then see the impacts immediately in our simulators En-ROADS and C-ROADS. Challenging but possible. Grounded hope. That being said, it isn’t easy. Take “grounded”: Playing with a rigorous simulator disappoints many. Change takes time. There are no silver bullets – not even wind, solar or energy efficiency. The U.S. can’t do it alone. China can’t do it alone. Methane matters. Now take “hope”: Sharing a positive vision challenges many. Resignation feels safe. Sharing aspirations can leave one vulnerable. We have little experience asking for what we really want for the future. Time and time again, we hear people more able to “own” or take responsibility for climate action after creating and experiencing a rigorous pathway of success. 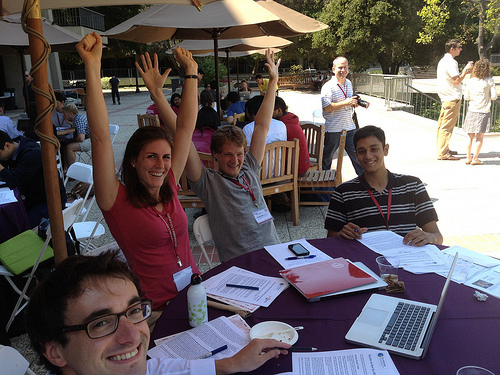 The faces of the Stanford students (above) discovering their pathways are inspiring. Check out their work. “We’re screwed” – When we hear resignation, we know that people should be exploring pathways to success. “Just doing what we can will add up” – Rosemary Randall described how unsatisfying this can feel: “When there is no connection between the increasingly bleak news from climate scientists and the scale of actions people are encouraged to take, the turmoil of feeling produced by the news is left to churn away, unattended.” In other words, “civilization could be doomed and you want me to change a lightbulb? Really?” We need to give people chances to imagine disruptive, transformational, large scale change. “There’s no problem” – Denial can be a symptom of our past reliance on the strategy of “climate disruption is a huge problem – let’s work on solutions.” Having a big problem and no solution is too psychologically painful, so our brains are open to the abundant disinformation that helps us deny that there is a problem. Self-discovery – People learn deeply by doing, not by listening or reading. So we make the simulation learner-directed and interactive. Science-based – We loosen constraints on what is politically feasible but keep them tight on what is technically feasible, for example, how long power plants stay in place, the lifetime of atmospheric carbon, the effect of a carbon price on energy demand and so on. System-wide – The simulation spans many areas of leverage: population, consumption, energy supply, energy efficiency, land use, agriculture and carbon pricing. Truly high leverage – Attractive but insufficient half-measures are abundant. The simulator shows the limited contribution of waiting for a low-carbon energy miracle, long term reliance on natural gas and other approaches. Yes, we still need to explain and re-explain how the climate system works and of the problem of unmitigated climate disruption. And, we need more emphasis on the counterintuitive approach I’ve outlined here. With the diffusing of grounded hope, we can see a self-reinforcing process spring into action: more faith in solutions allows more acknowledgement of the problem. And more acknowledgement leads to investment and faith in solutions. Grounded hope. Let’s do it!